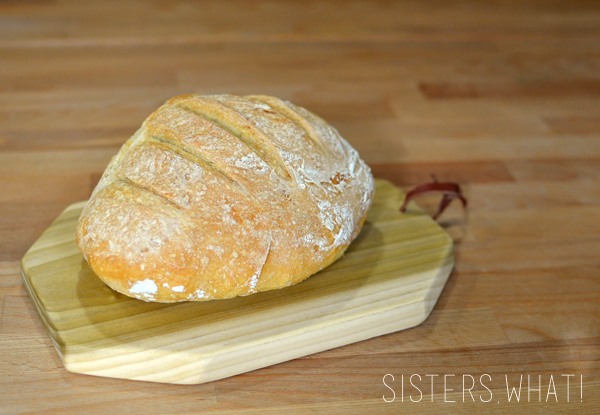 ' 5 Minute Artisan Bread - Sisters, What! 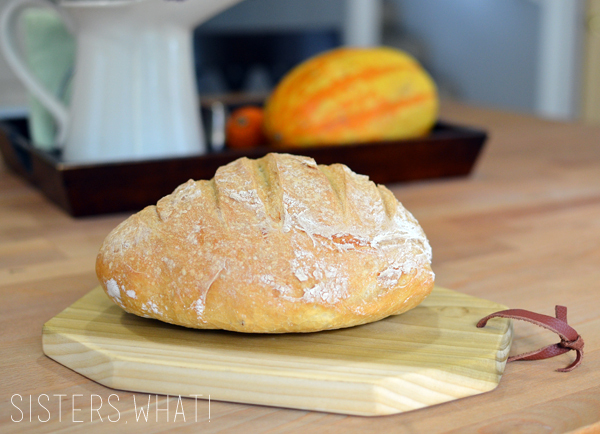 Today I'm going to share with you my recent discovery of making artisan bread. You know the kind that you eat at good Italian restaurants and what most Europeans eat. However, this version is all white flour, but once you get past the whiteness of the bread, then you will find something totally delicious and SOO EASY to make. I came across the book The New Artisan Bread in 5 minutes a Day by accident and thought it was worth the try. It took me a month or so to finally put the recipe to the test, but when I finally did it was really easy. However, when I first tried it, the apartment we lived in had a terrible, uneven heated oven, so the bread turned out ok. But since moving, I've tried it again and crazy enough, the oven made the difference and I've never stopped making it. And I'm here to tell you that it is as delicious as it looks and SO EASY and quick to make. Well, it still takes time, but time being needed to let it rise and cook and such. 1. Warm the water slightly and mix with yeast and salt to a 5 or 6 quart bowl or container (lidded, but not airtight plastic container). You don't need to let the yeast rise. 2. Mix in the flour- kneading is unnecessary: Add all of the flour at once, Mix with a wooden spoon or a danish dough hook (wish I had one). If you're hand mixing and it becomes too difficult to incorporate all the flour with the spoon, you can reach into your mixing bowl with very wet hands and press the mixture together. It isn't necessary to knead. When done, everything should be uniformly moist. 3. Allow to rise: Cover with a lid (not airtight). If using a bowl, cover with towel or plastic wrap loosely; you want the gases to be able to escape Allow the mixture to rise at room temperature for about 2 hours or until dough flattens. This might take longer depending on the initial water or air temperature. DON'T PUNCH DOUGH DOWN; like I said, it will flatten on it own. Longer rising times (up to 5 hours) will not harm the result. You can use a portion of the dough any time after this period. Fully refrigerated wet dough is less sticky and is easier to work with than dough at room temperature. The authors recommend that the first time you try this recipe, you refrigerate the dough overnight (or at least 3 hours) before shaping a loaf. The next day when you pull it out of the fridge, you will notice that the rising dough has gone down a little, totally normal. It won't rise again like it initially did. 4. The gluten cloak: don't knead, just "cloak" and shape a loaf in 30 to 60 seconds. I like to place a piece of parchment paper on a flat cookie sheet and sprinkle flour on it. If you have a pizza peel, that works great too. But make sure you liberally cover it with flour or cornmeal. 5. Sprinkle the surface of your refrigerated dough with flour. Pull up and cut off a 1-pound (grapefruit-sized) piece of dough, using a serrated knife. Hold the mass of dough in your hands and add a little more flour as needed so it won't stick to your hands. Gently stretch the surface of the dough around to the bottom on all four sides, rotating the ball a quarter-turn as you go. Most of the dusting flour will fall off; it's not intended to be incorporated into the dough. The entire process in this step should take no longer than 30 to 60 seconds. 6. Rest the loaf and let it rise: Place your shaped dough ball on prepared parchment paper on cookie sheet or pizza peel. Allow the loaf to rest on the peel for about 40 to 90 minutes. The book says the longer rising time the more holes in the bread (holes are a good thing in artisan bread - makes the bread lighter). The bread won't rise much doing this time, that will happen during the baking process. 7. Twenty minutes before baking, preheat the oven to 500 degrees F (the book says 450, but I've read other recipes that suggest 500 and then bring the temp down)., at the same time, preheat your baking stone, cast iron skillet or other bread dish placed on the middle rack *they don't recommend glass because of high temps, but I've used oven safe glass bowls and I've never had an issue; I've read other recipes that recommends using them...so up to you. Place an empty broiler tray (or bread pan works too) for holding water on shelf below the bread. 8. Dust and slash: Dust the top of the loaf liberally with the flour and slash a pattern on top of bread. This will help the bread expand better. 9. Baking with steam: After a 20 minute preheat, you're ready to bake. BRING the temp down to 450! 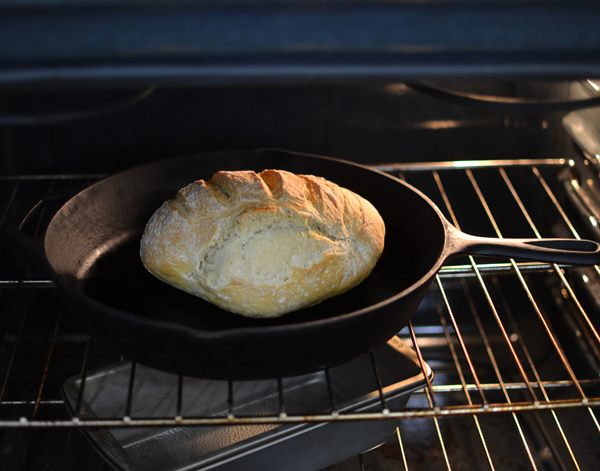 I hate the idea of sliding my loaf into the preheated baking stone, so I just lift the parchment and place it right into the stone/iron skillet and call it good (also recommended on their site). Quickly but carefully pour about 1 cup of hot tap water into your broiler tray or bread pan and close the oven door to trap the steam. If using parchment paper, bake for about 20 minutes then remove the parchment paper and bake for another 10, or until the crust is nicely browned and firm to the touch. Because you've used wet dough, there is little risk of drying out the interior, despite the dark crust. Allow the loaf to cool completely, preferably on a wire rack. 10. Store the remaining dough in the refrigerator in your lidded (not airtight) container and use it over the next 14 days. 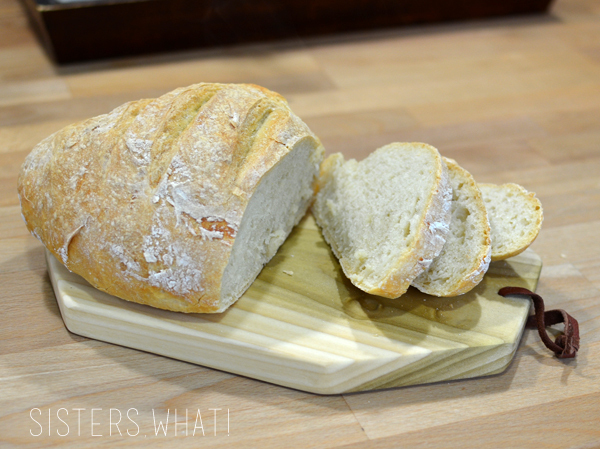 The dough "matures" over the 14 day period, improving flavor and texture of your bread. Cut off, shape and bake more loaves as you need them. Go to their website for more pictures on the process. Like the cutting board? Find a tutorial for it on my here. This looks fantastic! I've never been good at ANYTHING that involves yeast. I will have to give this one a shot... it looks pretty jenni-proof! If I came find some granulated yeast then game on eating fresh homemade bread! Oh wow, this looks amazing! I have been looking for some ideas for different ways to use my cast iron skillet. This looks like a winner! Thanks for sharing it with Hump Day Happenings. 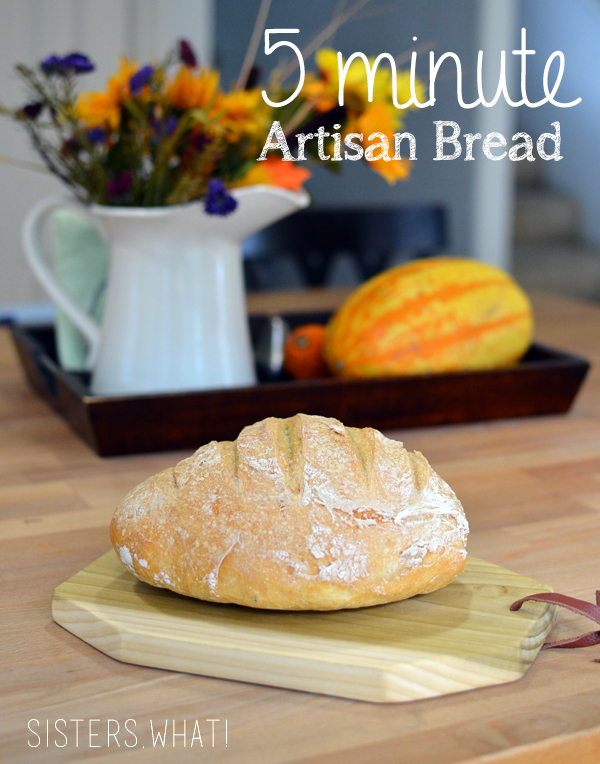 I love artisan bread and homemade bread is even better!